Clipper Stad Amsterdam was designed by Gerard Dijkstra NA who modelled her after the mid-19th century frigate Amsterdam, but she is not a replica. A major difference is that the hull is made of steel. The owners call the ship a “modern extreme clipper in historical perspective”, meaning that the construction method is a combination of the best qualities of clippers of the past, outfitted and built with modern techniques but with a classic ‘look and feel’. Even though she was not built as an extreme clipper, it is popular to call all clippers “extreme” because of the popular conception of speed. She is a very fast ship, with 15 knots being a normal speed. She won the 2001 Cutty Sark Tall Ships’ Races. The building of the hull in 1997/98 was carried out as a work experience project for the unemployed (metalworking and welding). 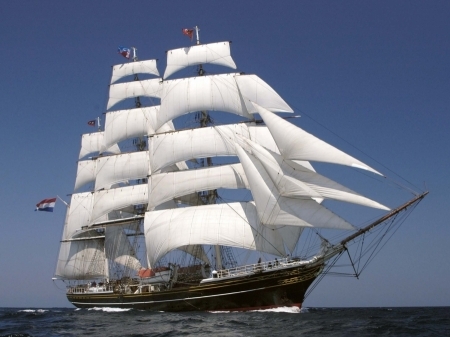 The ship was first presented to the public at the 2000 edition of SAIL Amsterdam. During the 2005 edition of the event she was the flagship. The ship is used for sail-training and as a charter-ship for guests. The crew originates mostly from the Netherlands and Denmark and always consists of many nationalities. The official language on board is English. The home port of Clipper Stad Am,sterdam is Amsterdam.